Even Steven Spielberg can’t save Ready Player One from itself, and to be blunt, the pop culture-heavy book adaptation may be the director’s worst movie to date. Put another way: I’d rather watch Indiana Jones and the Kingdom of the Crystal Skull a dozen times straight with my eyelids taped open than sit through this clunky, boring, emotionally flat and visually draining action-adventure again. Hell, I’d even watch War Horse again. Ready Player One is set in the future where poor people live in “stacks”—literally vertical stacks of trailers—but where most everyone interacts in the OASIS, a virtual world where literally anything is possible and where pop culture references run amok more than they do in turn-of-the-century DreamWorks Animation flicks. After the brilliant but socially reclusive creator of the OASIS dies (played by the horribly miscast Spielberg late-years prodigy Mark Rylance), he leaves an Easter egg hidden somewhere in this amazing world—and whoever finds it will gain ownership over the OASIS and in turn trillions of dollars. Needless to say, everyone—including evil corporations led by stereotypically evil men—want to find it. 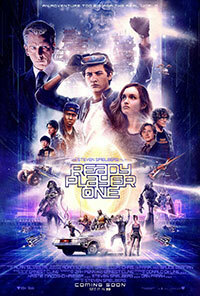 Theoretically, deep down, Ready Player One is prime to be made into a movie, where literally anything can happen and characters, props, settings and more can be drawn from just about any movie or video game that has ever existed (you could watch the movie ten times over and still miss all the cameos, though I’m sure some devoted fanboys have created full websites to chronicle everything that has been discovered). But in a movie where most of the action occurs within a video game where nothing looks real and the stakes are minimal—if you die, you just start over again—Ready Player One turns into a tedious affair of shockingly bland CGI action and artificial characters who you don’t care anything about. Spielberg has delivered some of film’s most classic and timeless sci-fi films—even his less acclaimed ones are better than most—and so it’s both surprising and depressing that he misses the mark so massively. Spielberg has staged some of the most memorable action sequences in cinematic history, yet pretty much all of the action here is instantly forgettable, just a bunch of pixels moving around on the screen. Ready Player One does get better as it goes along, with the central plot mildly enticing as the film finally kicks into gear. Spielberg delivers a few moments—an overhyped but still satisfying segment that drops the characters into The Shining, and a short stretch where Chucky the Doll flies around stabbing people with a knife is funny—and he hints at an interesting real-world where the rich-poor gap has widened even further than it is now. And it says something when the best part about a movie that takes place almost entirely within a virtual world are the parts that take place in the real world. Unfortunately, neither the cast nor characters are particularly interesting, which in turn makes their motives, ambitions and actions uninteresting. Ready Player One is an overstuffed CGI adventure that even Spielberg can’t manage. The film becomes so consumed with its juvenile plot and endless stream of Easter eggs that it loses sight of what, possibly, maybe, conceivably, could have been an interesting sci-fi action-thriller. This is one Spielberg movie you should never load.